Watch out... They're watching you! This terrific tasting cherry bubble gum will give you a run for your money!! The white coat is excellently detailed with red speckles to imitate the appearance of blood and is detailed in black for the eyeball middle. 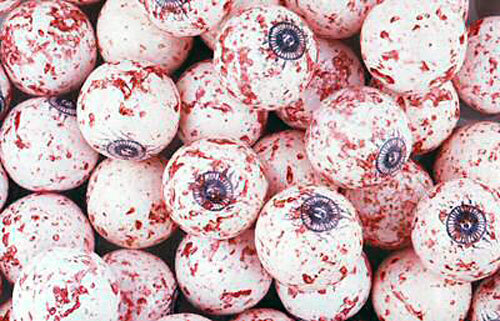 These creepy looking balls of gum make a funny snack all year round. This gumball continues to be a tried and true favorite among children, pranksters, and trick-or-treaters alike! They're great for Halloween, April Fool's, or for pranking family members or co-workers any time of the year. You can choose between a 1 pound bag or a 2 pound bag of gumballs, and shipping on orders up to 2 pounds is only $5.00! For more flavors be sure to see our full selection of gumballs by the pound. Weight: Your choice of 1 lb., 2 lbs or 5 lbs. Made by Oak Leaf, these bulk vending gumballs are OU Kosher Certified. Gumballs store best in a cool, dry, low humidity location. Their shelf life can be up to 18 months if not exposed to extreme hot or cold temperatures. Email or phone for special shipping rates for HI, AK & and International or wholesale pricing.